Catherine Patterson, MPP, joined the de Beaumont Foundation as a Program Officer in April 2014. In this capacity, Patterson is responsible for the administration and management of the Foundation’s grant portfolio. In June of 2015, Patterson helped launch the BUILD Health Challenge, a funding collaborative that leverages the funding dollars and support services of five organizations. BUILD offers over $8 million in grant funds in order to stimulate and support innovative partnerships between hospitals, public health, and communities to improve opportunities for health across the United States. Prior to joining the Foundation, Patterson worked at the Pew Charitable Trusts. As a part of the Pew Children’s Dental Campaign, Patterson led efforts in several states to help expand access to preventive oral health services, such as dental sealants and fluoridated water. While at Pew, Patterson led a successful campaign to secure a regulatory change that expanded access to fluoridated water for over 4 million people. 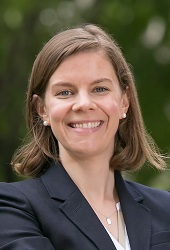 Prior to working at Pew, Patterson taught preschool for five years, leading classrooms for both Head Start and the Virginia Preschool Initiative. Patterson holds a bachelors degree from Hobart and William Smith Colleges and a master of public policy from the University of Maryland.